Fall flavours are some of my favorites – full of warm spices and comfort food both savoury and sweet. Living in Trinidad for the last 6 years, I enjoyed fall flavours but without fall. This is the first year in many that I have enjoyed fall flavours with the fall weather, leaves and sweaters. If I were to choose I would choose fall flavours with tropical weather any day. Sorry to disappoint, I’m very much a warm weather lover and would even sacrifice the beauty of fall for warmer weather. What I don’t have to sacrifice no matter the weather is fall spices and flavours and this recipe is completely infused with them. 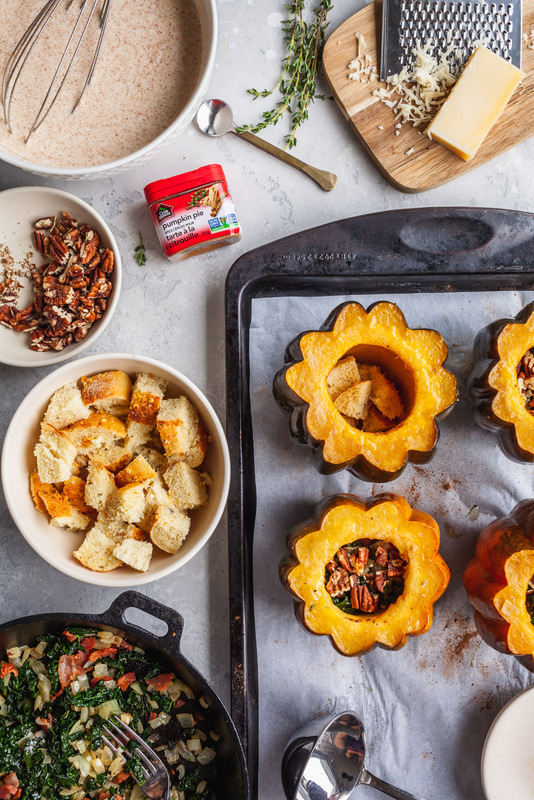 Pumpkin pie spice is for more than pumpkin pie - Savoury Stuffed squash with bacon & kale bread pudding - both the squash and creamy filling were spiced with Club House’s Pumpkin Pie Spice and the result = a taste of fall in every bite! It’s nice to have a spice blend like this at your fingertips - saving time blending your own and pantry space. Club House has a few of these lovely and handy spice blends that make baking and cooking fun and convenient. Make sure and checkout their website to see all the spice blends along with recipe ideas to use them in. 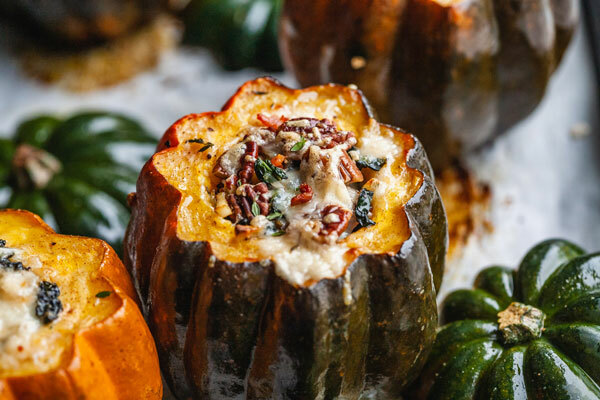 These stuffed squashes are stuffed to the brim with a delicious combo of ingredients. 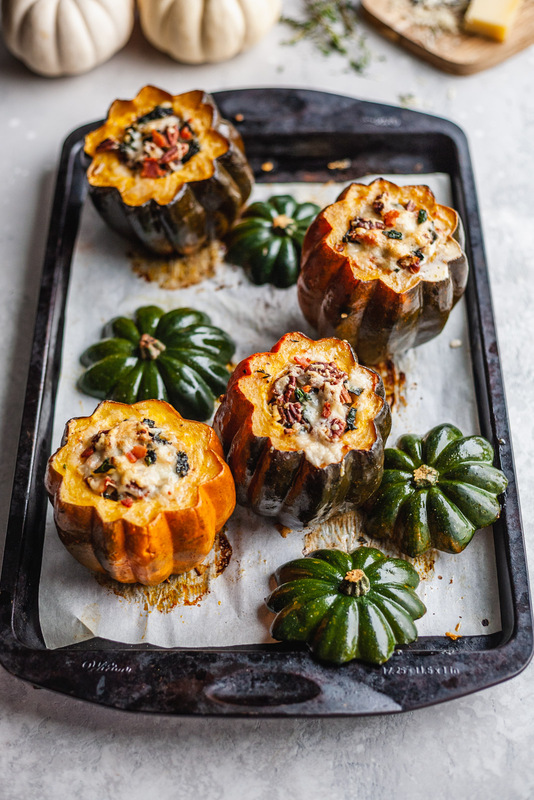 It’s called a bread pudding stuffed squash because part of the filling is cubed crusty bread which soaks up all the flavours so well from the spiced cream and also from the rest of the ingredients. The spiced cream with the bread takes this luscious dish from a starter/side dish to a main. 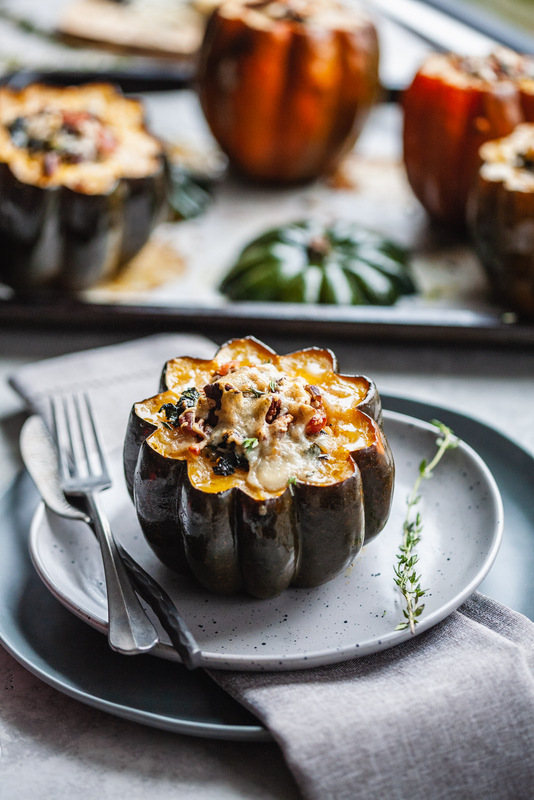 It’s such a pretty looking dish as the shape of the squash is always eye catching and also makes it the main attraction as well. The liquid ingredients may look like a lot, but have no fear they are fully absorbed by the bread and the squash itself. 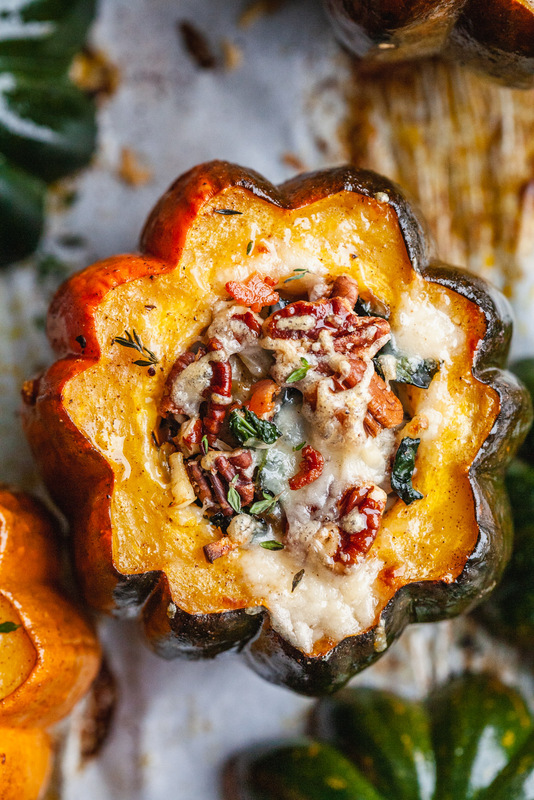 Make sure to over-stuff the squash a little as the ingredients tend to sink in with the whole liquid absorption process. If you don’t have any of these baby squashes around feel free to use baby pumpkins in place of them or you can use some small butternut squashes as well. Although if using those you will have to cut those in half lengthwise and stuff them open faced. The flesh of the squash gets so tender and is lightly spiced, seasoned and buttered before stuffing. 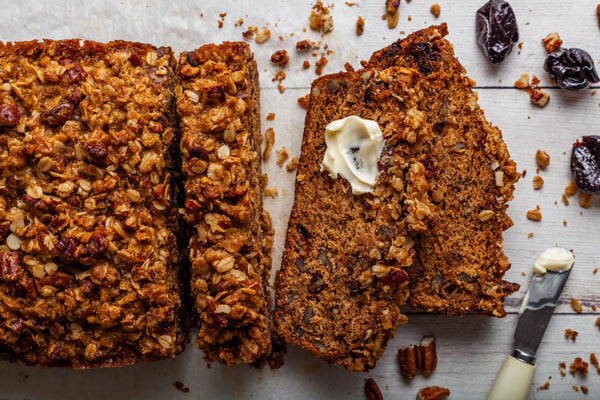 It absorbs these flavours and then later the lovely flavours of the stuffing making it a delight to eat in each bite. 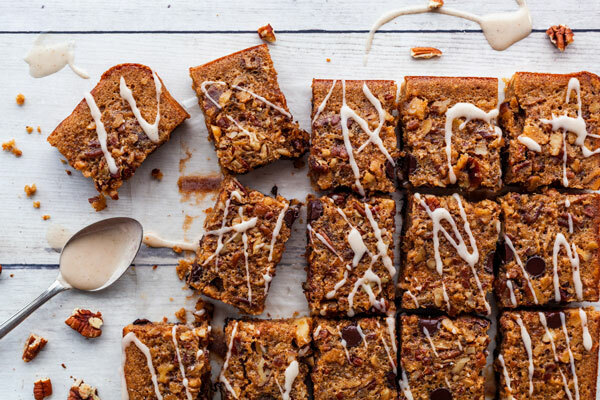 This recipe is easily made vegetarian by swapping the bacon for meaty mushrooms. The bacon itself can also be replaced with Pancetta or even spicy sausage pan fried in place of it. The meat, in this case the pork, adds so much flavour to the filling and a nice bit of saltiness and crunch. Speaking of crunch, I love the crunch the pecans add to the filling as well. They are perfect with anything spiced and that goes for this dish as well. If you know me, you know I’m very much a savoury food lover not so much of sweet tooth here. 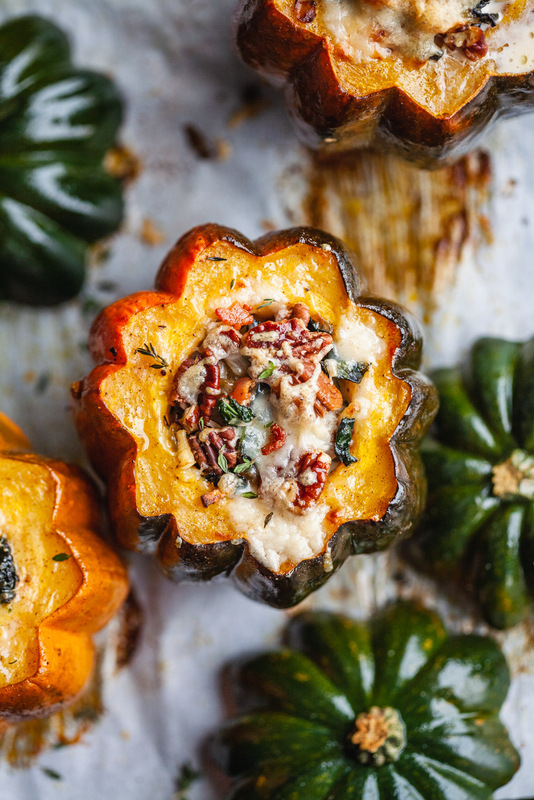 This is one of my favorite Fall foods I have made this season encapsulating all the Fall flavours I love in a delicious and most appealing dish. It’s very easy to make although it takes a little while to make with a few simple steps. 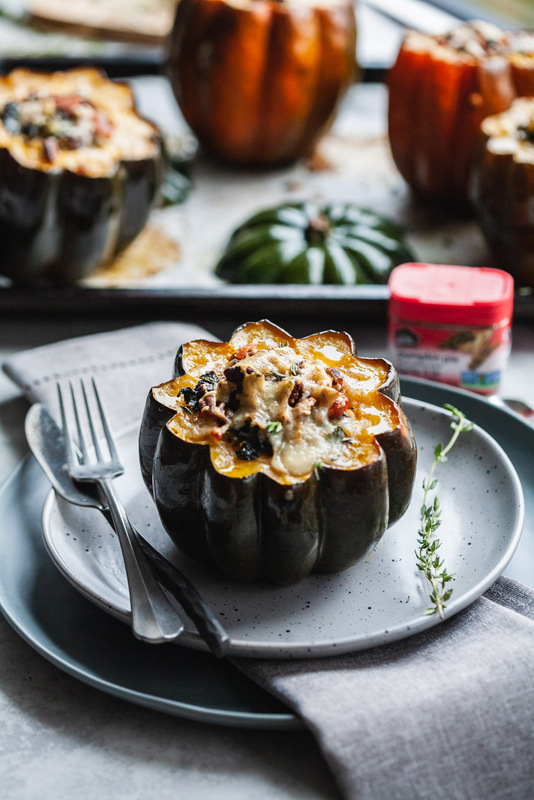 It’s well worth the few steps to enjoy this creamy cheesy and deliciously stuffed squash that I know you and your family will love. This is a sponsored post for Club House. All thoughts and views are my own. Remove the stems from the squash. Cut each squash in half crosswise and scoop out the seeds with a spoon and discard. 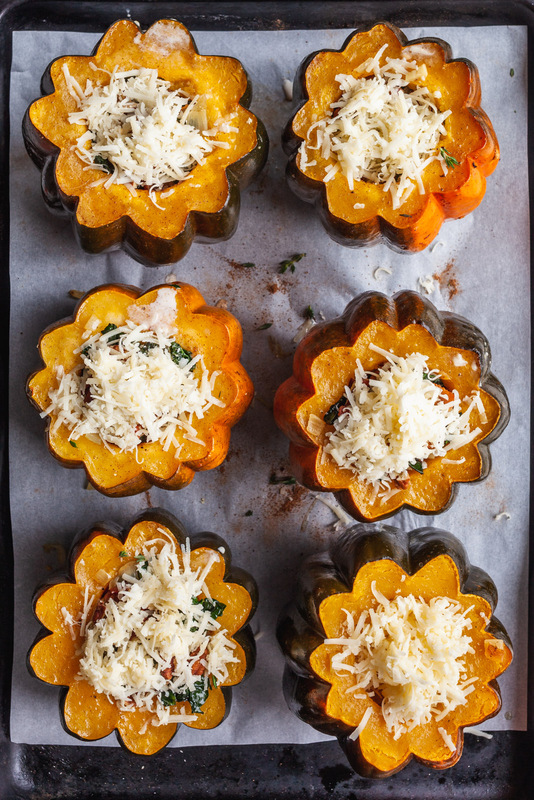 Cut a sliver off the squash bottoms so they will sit flat. 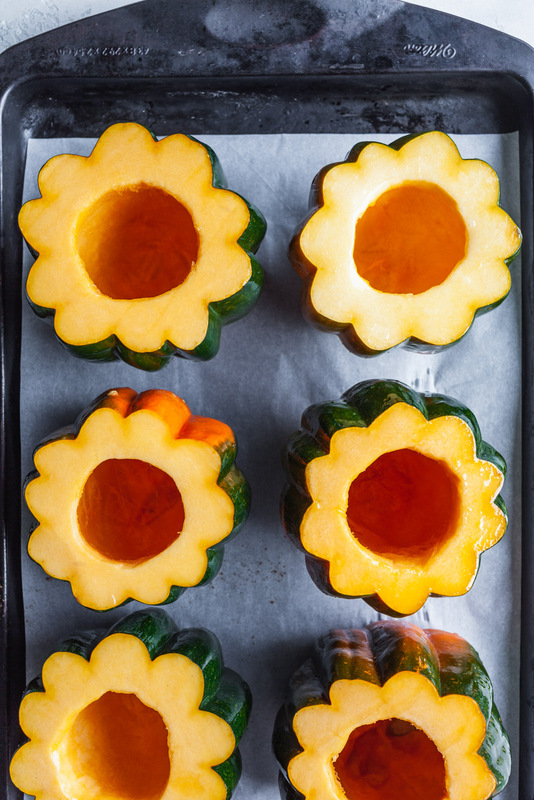 Place the squash halves, hollowed side up, in a baking dish large enough to hold them. 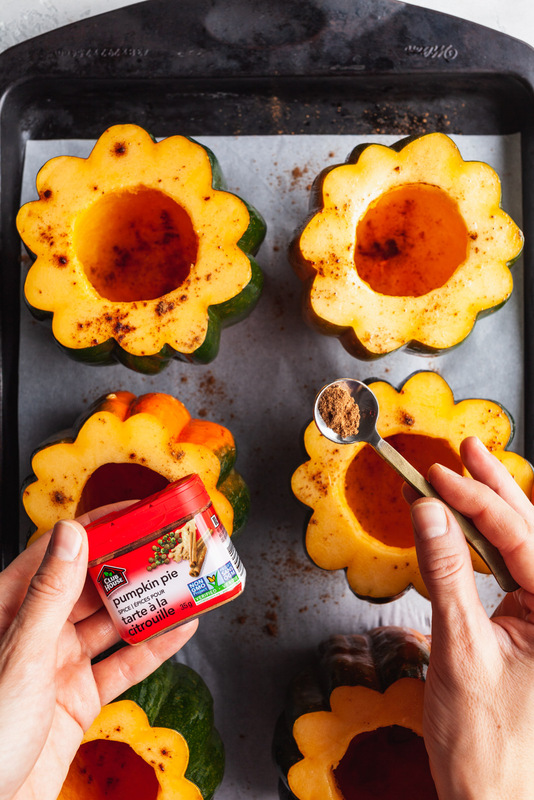 Sprinkle the insides of the squash with salt and pepper and pumpkin spice mix and place in a piece of butter in the center of each. Pour ½ cup water into the dish around the squash. 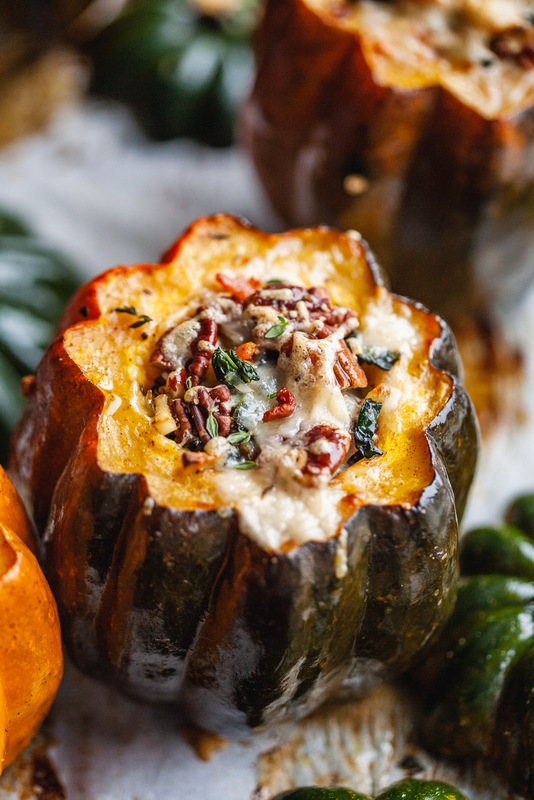 Cover the baking dish and maintain the baking dish tightly with aluminum foil and bake until the squash are tender when you insert a small, sharp knife into the flesh. 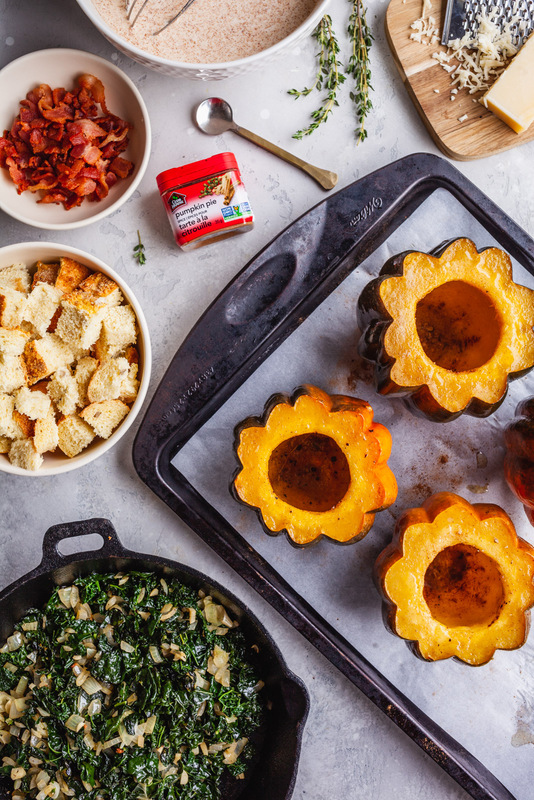 Keep the squash in the baking dish and maintain the oven temperature while you prepare the stuffing. To make the bread pudding stuffing, cook the bacon in a large, heavy skillet over medium-high heat until it begins to brown, about 3 minutes. Remove the bacon and let it drain on paper towels, then crumble and set aside. Drain all but 2 teaspoons of the bacon drippings into the skillet. Add kale to now empty center of skillet, and cook, stirring frequently, until kale is slightly wilted and softened, about 3 minutes. 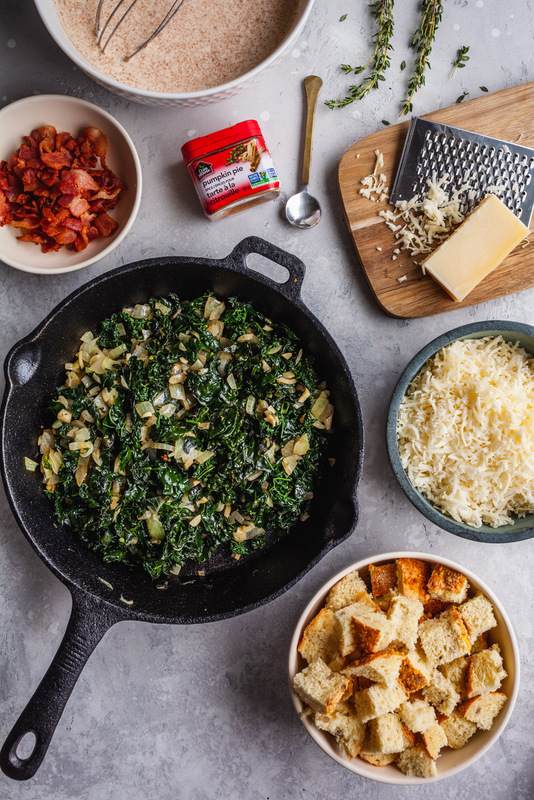 Push the kale to outer edge of skillet and add butter to center of skillet. Once butter has melted and begun bubbling, add onion, garlic, and thyme to center of skillet and cook, stirring constantly, until fragrant, about 30 seconds. Season with salt and pepper and transfer mixture to a heatproof medium bowl to cool. Whisk together cream, milk, pumpkin spice, paprika, pumkin purée in a large liquid measuring cup or in a bowl. Season to taste with salt and pepper and set aside. 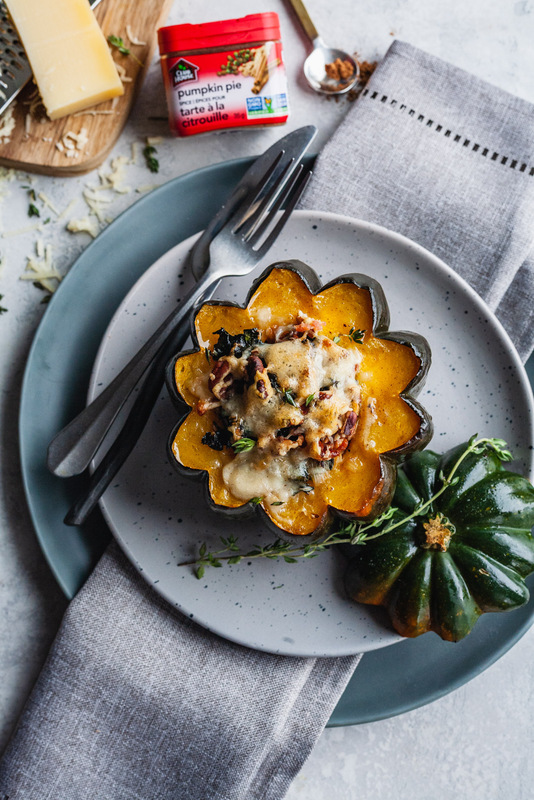 Roast squash on baking sheet, without tops, until top layer of cheese is melted and lightly browned, and squash are tender and easily pierced by a paring knife, 30 to 45 minutes. Remove squash from oven and cool on baking sheet for 5 minutes. Using a large spatula, carefully transfer squash to a serving platter.